A great listing just showed up on ebay for a Complete NES Game Collection with Nintendo World Championship. A collector could get every single game made for the NES plus quite a few unlicensed games and Nintendo World Championship in one auction. The starting bid is $999 and there is a reserve (much higher than that) but the seller is throwing in free shipping if you win. This auction will probably sell for more than $10,000. 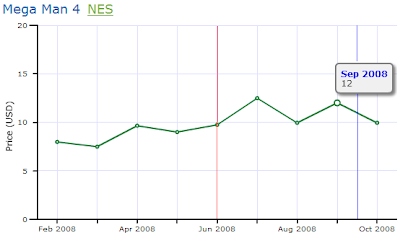 If you add up all the NES game values from our NES Price List page you get $5,600 and that doesn't included NWC. Collector's Edition games are all the rage with video game publishers. They package in a bit more material like a second disc with some "Making the Game" videos and maybe a hologram cover. And for this the publishers get an extra $10 from the gamers. Which version is the better deal for gamers though? If you only want to play the game the special edition versions are the more expensive option. 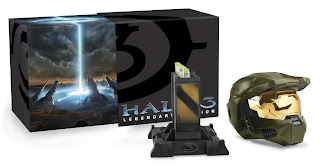 In general the collector's editions cost about $10 more, but some games like the Halo 3 Legendary Edition (at right) cost hundreds more. There is a slight chance if you buy a Limited Edition game that it will actually become rare and really sought after by collectors. 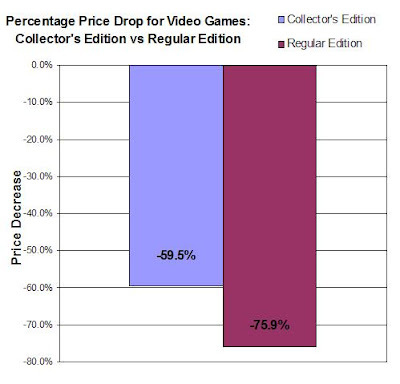 3.4% of the Collector's Edition games increased in value while 100% of the regular edition games decreased. One of the special edition games, Metal Gear Solid 3 Subsistence Limited Edition, sells for $170 on average. Some collector's/limited edition games include better bonus items than others, but almost every single one has at least a second disc with special material. Some include figurines, art books, music CD's, and every now and then all of the above. If you're a big fan of the series these extra items can be worth much more than the $10 price. Pro: There is a slight chance you can actually make money on the game. It costs you a bit more upfront but overall the special edition games have more going for them than their boring, regular edition counterparts. Methods: For the price portion of the article we compared the prices for Collector's Edition/Limited Edition games with their regular game counterparts (Mass Effect vs Mass Effect Collector's Edition, Ultimate Spiderman vs Ultimate Spiderman Limited Edition, etc). 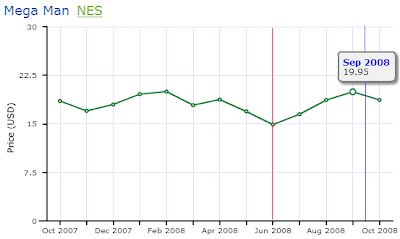 We calculated the price change from the original retail price to the resale price as of October 18th, 2008. 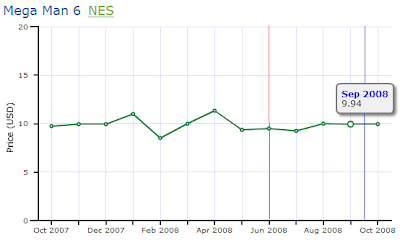 The prices shown are the average price changes for the two groups and are provided by VideoGamePriceCharts.com. "It was the best of times it was the worst of times." Charles Dickens' novel A Tale of Two Cities starts with this famous line. Dickens uses the line to contrast the times in London and Paris, London was doing well and Paris was not. The same can be said of Persona 2 and Persona 3. 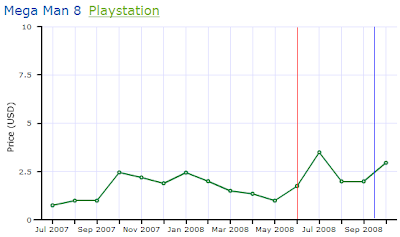 The price of Persona 2 has been increasing steadily over the last year and a half to about $85 but Persona 3 has been steadily dropping in price to $21. What explains the difference in prices over the last year? Both games are well regarded critically. They're both published by Atlus and a new game in the series came out. Persona 4 was announced for release in the US but that should increase the prices of both games as we have seen in past vgpc articles. The big difference is Persona 3 FES. Persona 3 used to be a relatively hard game to find for PS2. Atlus didn't make quite enough to meet the demand (as they are prone to do). 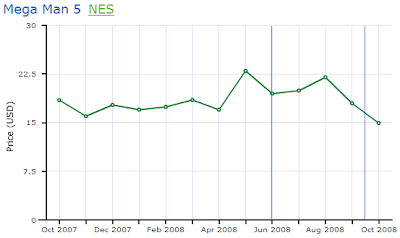 After Atlus released FES the prices for the original Persona 3 started to drop almost every month. People could buy a new version from almost any retailer. This brought down the price of Persona 3. 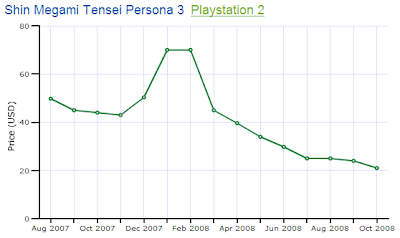 At the same time this increased the price for Persona 2 because it is no longer being published. 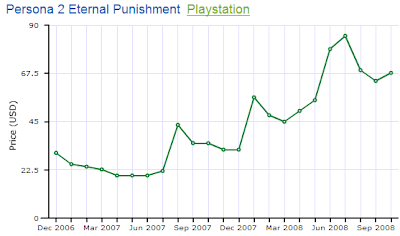 More people wanted to play other games in the series so the prices increased with the increased demand. The game sells for $62 used and $244 new. The game sells for $7 used and $150 new. The game sells for $5 used and $99 new. The game sells for $64 used and $119 new. The game sells for $32 used and $117 new. The game sells for $ used and $ new. Mega Man 9 is a brand new game in the original Mega Man series with 8-bit graphics (and slowdown and flicker like the old days). It was announced July 4th and released at the end of September 2008 on Wii, PS3, and Xbox 360. Did the game cause game collectors to go buy the original eight Mega Man games? And if so when did they buy the games, when MM9 was announced or when it was released? 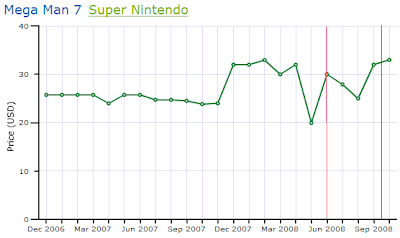 Using our price charts show below we analyzed the prices for all the original 8 Mega Man games. 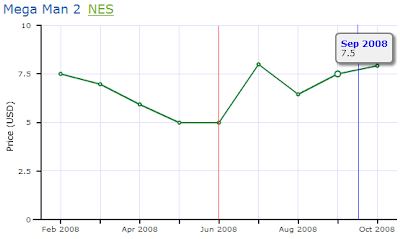 You can see that 7 out of the 8 original Mega Man games increased in price after the announcement. The average price increase was 16% from June to September. After release only 4 out of 8 games increased in price and only averaged a 3% increase. Gamers are like stock investors, they buy on the rumor and sell on the fact. 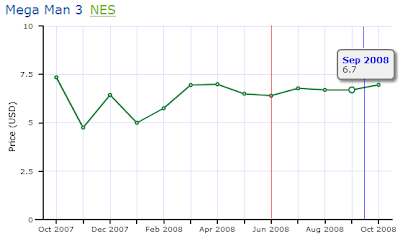 Mega Man games increased in price more in anticipation of the new game and didn't change much at all after release. In the charts below the red line is the price before announcement. The blue line is the release date.